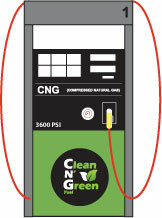 Clean N’ Green provides public and private customers with compressed natural gas (CNG) at a low cost. There are many locations nationwide and Clean N’ Green continues to build new stations every year. Many of the stations are open 24/7, accepts major credit card, as well as fleet cards through Clean N’ Green, Fleetwide, Fuelman, Voyager and Wright Express.